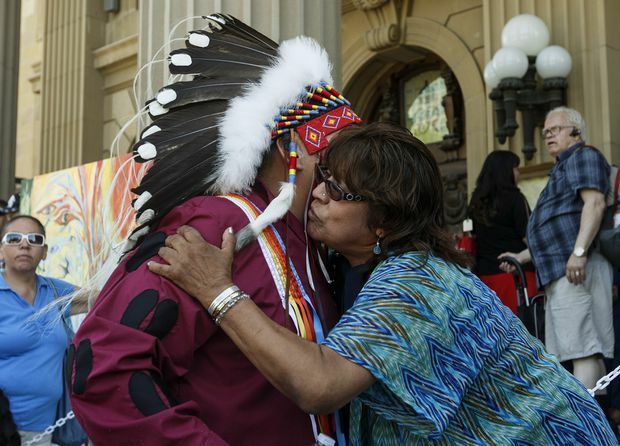 Sixties Scoop Indigenous Society of Alberta president and survivor Adam North Peigan hugs survivor Martha Cardinal after Alberta Premier Rachel Notley apologized to survivors and families of the Sixties Scoop in Edmonton, on May 28, 2018. Premier Rachel Notley has formally apologized for Alberta’s role in the Sixties Scoop, and although survivors say that doesn’t close the book on one of Canada’s darkest episodes, they say it does open a new chapter of reconciliation and healing. “We are sorry,” Notley said in the legislature Monday as survivors sat in the gallery, some wiping away tears. “For the loss of families, stability, of love, we are sorry. For the loss of identity, language and culture, we are sorry. For the loneliness, the anger, the confusion and the frustration, we are sorry. “For the government practice that left you, Indigenous people, estranged from your families and your communities and your history, we are sorry. For this trauma, this pain, this suffering, alienation and sadness, we are sorry. From the 1950s to the late 1980s, about 20,000 Indigenous children were seized from their birth families and relocated to non-Indigenous homes, stripping the children of their language, traditions and family ties. The apprehensions peaked in the 1960s, giving rise to the term Sixties Scoop. Alberta becomes the second province to acknowledge its role and to seek to make amends. Former Manitoba premier Greg Selinger apologized on behalf of that province in 2015. Alberta’s apology comes after a provincewide consultation during which, Notley said, some 800 survivors shared their stories. Many are still dealing with emotional trauma, which has been compared to that of residential school survivors. Notley said their experiences are heartbreaking. One of the survivors, Suzanne Wilkinson, travelled from British Columbia to hear the apology. She said the pain of that separation reverberates for generations. Even when family members reunite, some emotional wounds cannot be healed, she said. Sharon Gladue, another survivor, remembers a childhood in Saskatchewan living near a river, her father hunting for their food. “We were happy. We had children to play with,” said Gladue. She said that ended when case workers came and took the children away because the house didn’t have running water or electricity. In the end, Gladue said, Sixties Scoop children end up caught between two cultures, sometimes a stranger in both. Adam North Peigan, president of the Sixties Scoop Indigenous Society of Alberta, formally accepted the apology. He later told 200 supporters on the steps of the legislature that the work goes on. “We were robbed of our culture. We were robbed of our language. We were robbed of our traditions and communities as well as our identity as Indigenous people,” said North Peigan. In her speech to the legislature, Notley told survivors the province promises to work in the spirit of reconciliation and consultation in the future.